I always think of October as pumpkin season. So far we’ve been to a pumpkin patch as well as picked up pumpkins at a farm store. My kids are pumpkin crazy. That being said, I’ve put together some fun pumpkin themed motor planning ideas. 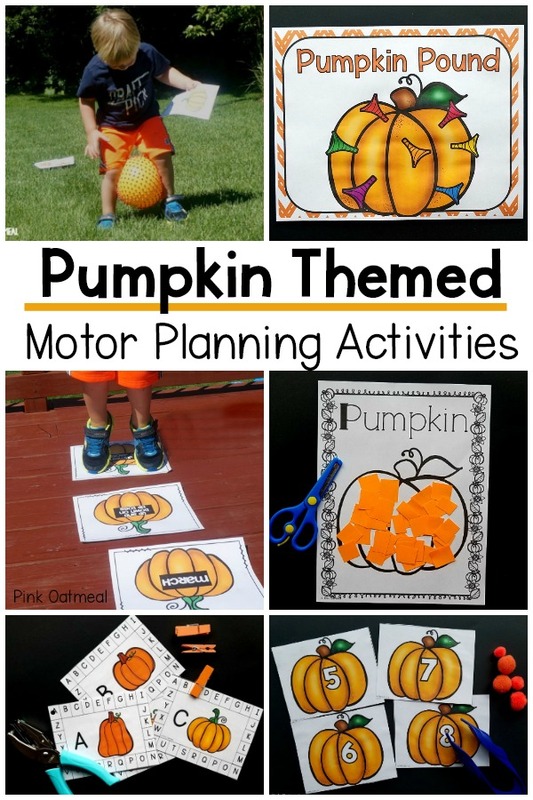 These pumpkin themed motor planning ideas touch on both fine motor skills and gross motor skills. The following pumpkin themed motor plannind ideas are great for use during the fall or around Halloween. 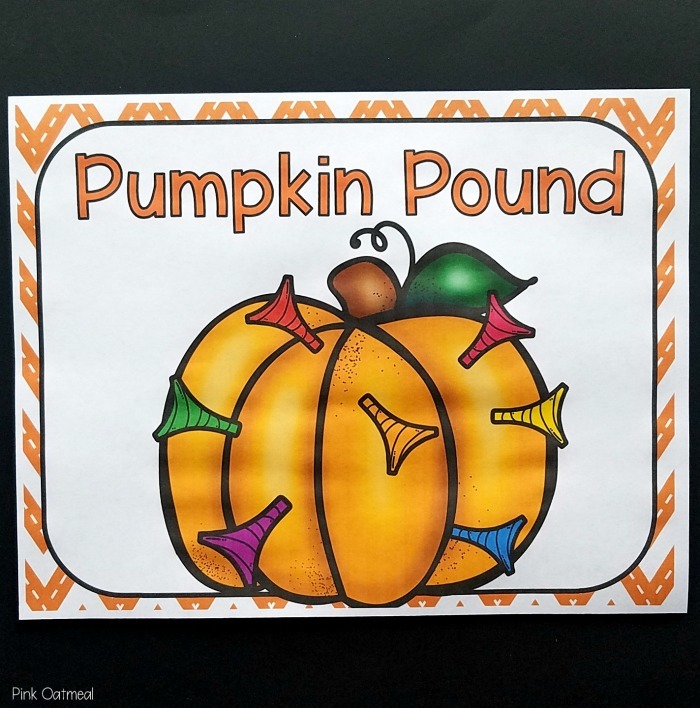 The pumpkin pound is great for eye-hand coordination and fine motor skills. Using a wooden hammer (like a lobster hammer), golf tees, and a pumpkin works great for this activity. Get to work by pounding the tees into the pumpkin. Use a big exercise ball and race around the cones. Get access to media library full of videos when you become a Pink Oatmeal member. This fun relay game can be played by carrying a “pumpkin” between your legs, holding it, or just plain racing to get the pumpkin cards. Spell out the word pumpkin and your team wins. Read about how to play the Pumpkin Relay Game in full. This game can be found in the Halloween Movement Games Pack. 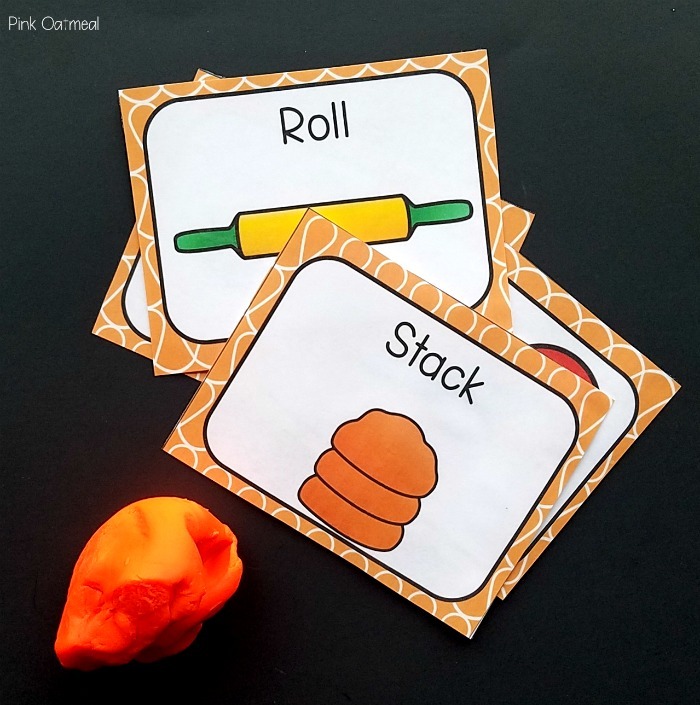 I’m giving pumpkin play dough a trial this year and using these task cards for ideas on how to use the pumpkin play dough. This activtiy can be found in the Pumpkin Fine Motor Pack. My boys are really into cutting and glueing activities right now. The pumpkin themed cutting allows for the best of both worlds. This activtiy can be found in the Pumpkin Fine Motor Pack. My five year old has been into pencil control activities. 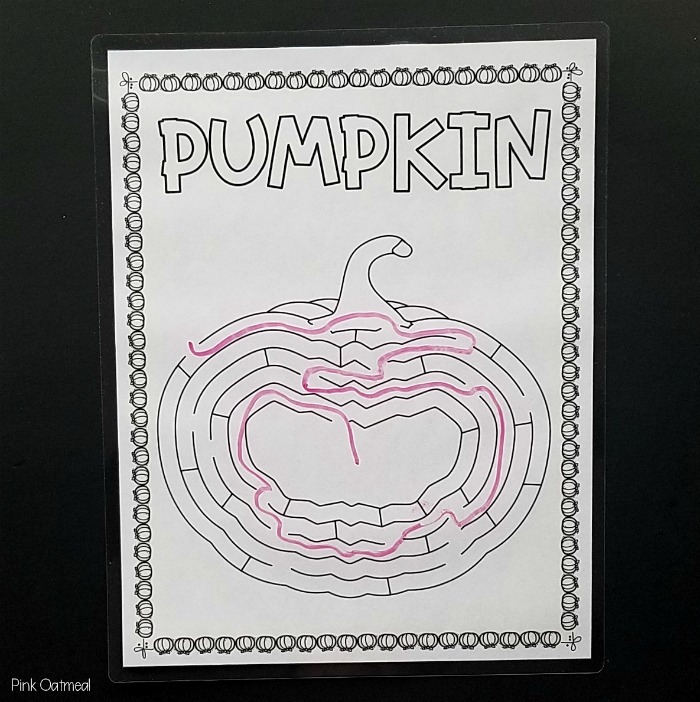 For the pumpkin theme we went with pencil control strips and pumpkin mazes. 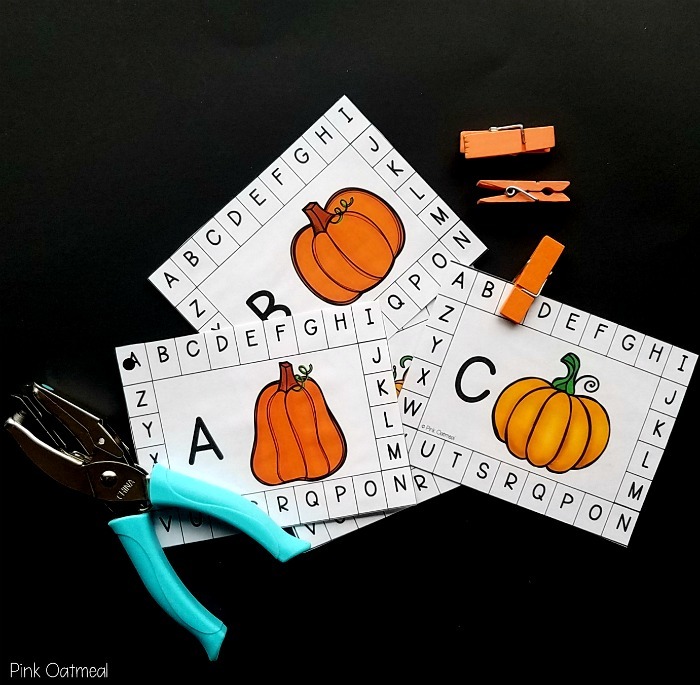 These activities can be found in the Pumpkin Fine Motor Pack. Music and moving go hand in hand with the pumpkin hop. Read about the full pumpkin hop game. You can find this activity in the Fall Themed Movement Games. 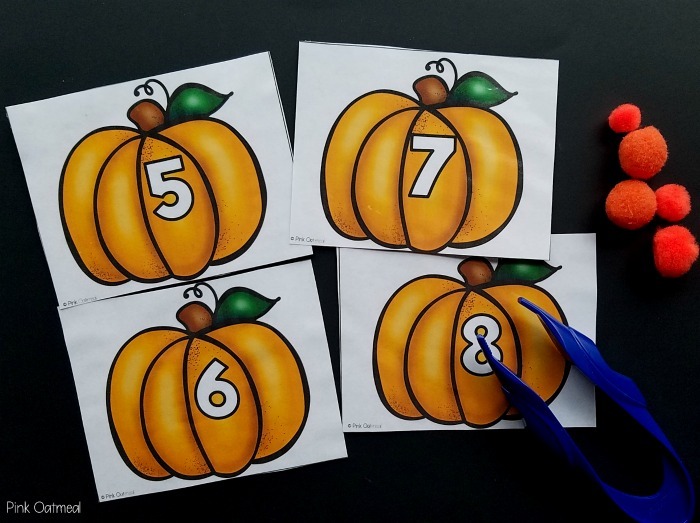 Pumpkin themed fine motor skills and letter recognition can be combined in this pumpkin themed fine motor activity. Use clips or punch holes ot match the letters. This activtiy can be found in the Pumpkin Fine Motor Pack. Use a ball “aka pumpkin” and roll it on the wall in all directions. 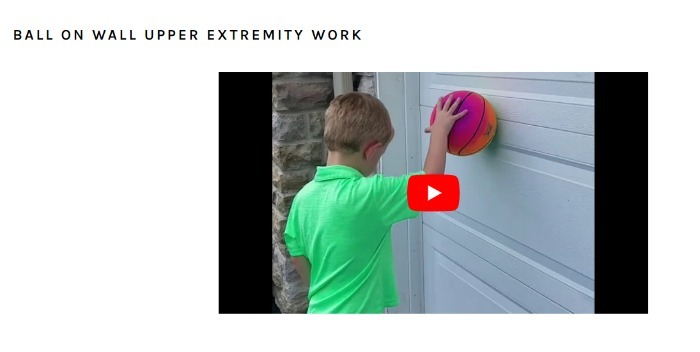 This great work for the upper extremity! Members get full access to a video library full of ideas! 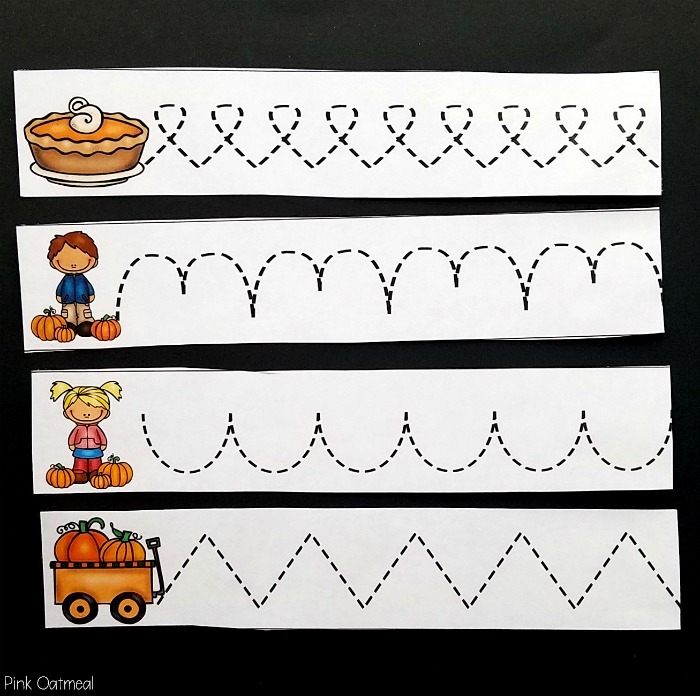 Another fun fine motor practice activity involves transferring poms while working on one to one counting! This activtiy can be found in the Pumpkin Fine Motor Pack. My five year old has been working on pre-writing strokes. 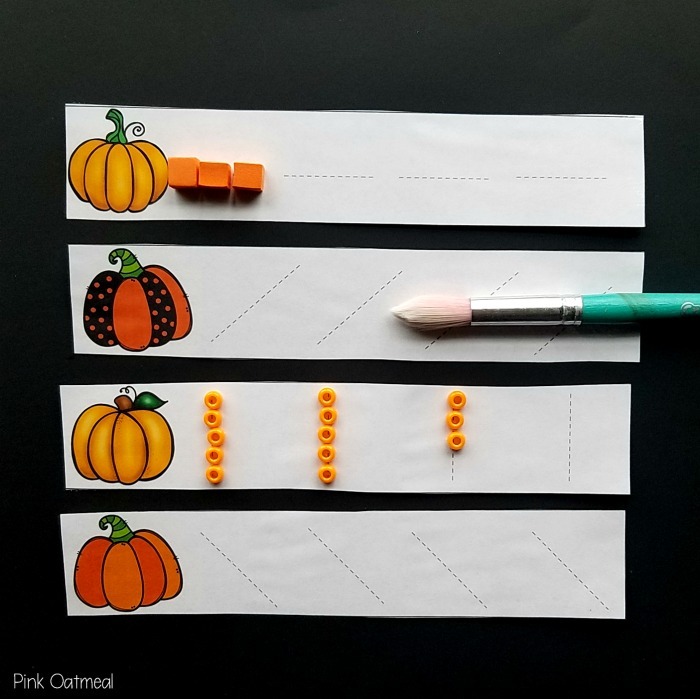 This pumpkin themed activity focuses on pre-writing strokes which need to be developed before kids actually start writing letters. I love pre-writing strips because they can be used over and over again and wiped off with a paper towel. 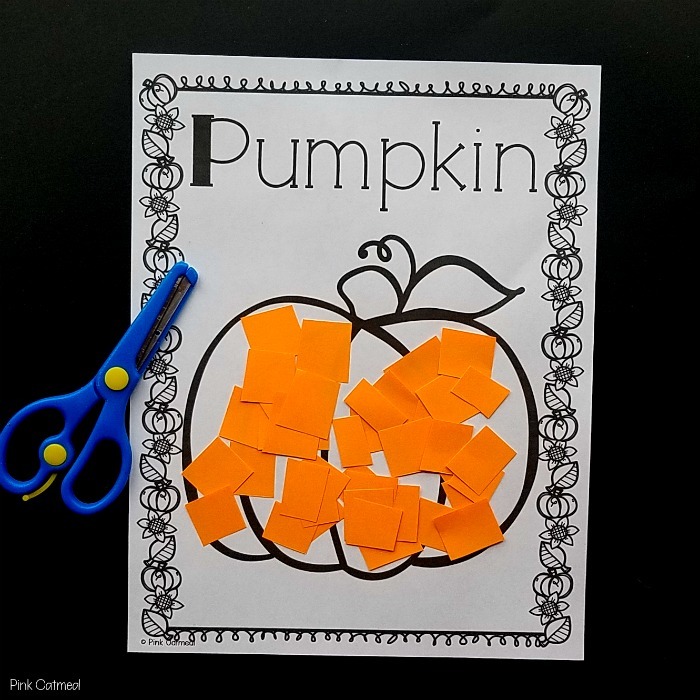 This activtiy can be found in the Pumpkin Fine Motor Pack. If you love having everything done and planned for you, you can. Themes and activities are yours when you become a Pink Oatmeal member! 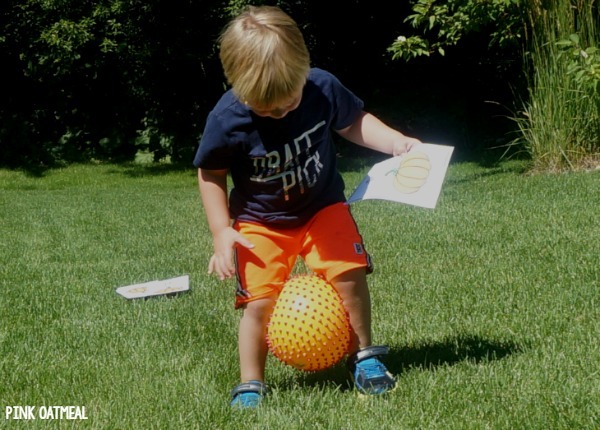 Some of my favorite resources for gross motor play as a physical therapist and mom! Click on each photo for a full explanation of product. Affiliate links.